At ECM TRANSPORT we work closely with our customers and our focus is to help "prevent" claims by sharing our knowledge. We take great pride in our low truckload claims ratio of 0.1% and in order to prevent claims from happening, we will work with you to help ensure your freight is bound for success. Truckload shipments are subject to the Uniform Straight Bill of Lading, found in the National Motor Freight Classification (NMFC). ECM TRANSPORT handles all claims in compliance with the regulations outlined in the NMFC Principles and Practices for the Investigation and Disposition of Freight Claims, the terms and conditions of the Bill of Lading and any applicable portion of the ECM TRANSPORT Rules Tariff and/or sales contract. The following information will help guide you through the freight claims process and help us in our Claims Prevention efforts. If you need more information, please contact our claims department at 800-548-7379. Freight claims can be sent to: ECM TRANSPORT, LLC, 1 Rich Hill Road, Cheswick, PA 15024, or filed online at www.ecmtransport.com. What should I expect to happen after the claim has been filed? Freight carriers are given 120 days to resolve any claims. At ECM TRANSPORT, we strive to resolve our freight claims as quickly as possible. In fairness to all of our customers, we process freight claims in the order that they are received. If you are filing a claim for damaged freight, we encourage you to send pictures illustrating both the condition of the freight and the condition of the packaging. If you have filed your claim online, you may upload pictures at that time. 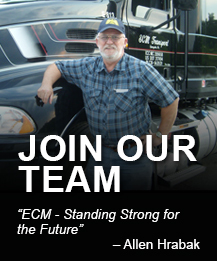 You may email pictures to claims@ecmtransport.com. Please do not fax pictures.